As John 'Hannibal' Smith stated many times in the 80s..... "I love it when a plan comes together" and that is exactly what Tom Becker delivers with Blackjack, his final instalment in the brilliant Darkside series. All loose ends have been tied and the story arc started back in 2007 with Darkside is finally brought to a deeply satisfying conclusion. Back in 2007 Mr Becker was the winner of the Waterstone's Children's Book Prize for that first book in the series, and the quality of writing and has been of a consistently high level ever since, so is was with much anticipation that I ordered Blackjack after seeing it on Amazon before its official release date of 1st February. However, it is also with some trepidation that I approach reading 'last in a series' books where I have greatly enjoyed all of the previous books - there is always a lot of pressure on authors to reward their long-standing readers with a satisfying conclusion, and not all authors manage it. I am delighted to say that Tom Becker certainly did not disappoint. If you have not yet discovered the Darkside series then where have you been over the last few years? Just to set the scene, the books focus on a boy called Jonathan who discovers a world hidden in London; a world run by the ancestors of the infamous Jack the Ripper. It is a world resembling a totally depraved Victorian society, populated by the very dregs of society - murderers, thieves, vampires, werewolves and a host of other particularly nasty characters and creatures. The books are full of action, blood, horror and really great characters. I am reluctant to say too much about the plot of Blackjack, for fear that it will ruin your enjoyment of earlier books in the series, should you not yet have read them. Suffice to say that the action is more non-stop in this book than in any of the previous stories as all the scene setting took place a long time ago. I finished this book in one sitting (reading well into the night) as I refused to put it down for fear that I might stumble across another review for it with accidental spoilers that could ruin my reading experience. Throughout the series Mr Becker has also developed the quality of his horror writing - this is a series of books that will have great appeal to readers new to the horror genre, who are maybe only just discovering Darren Shan's Vampire books. With the current popularity of all things steampunk, hopefully more readers will try the Darkside series with its quasi-Victorian setting. 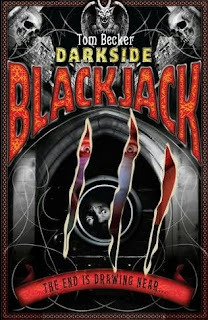 The Darkside books are suitable for readers of 11+; Blackjack is the fifth book in the series published by Scholastic and is scheduled to be in stores on 1st February, but if you're lucky you may spot it early. Thirdly (and most importantly)... great story! As a result of the Harry Potter phenomenon, over the last ten years the kids and YA market has been swamped with fantasy books (both good and bad). Similarly, the success of Anthony Horowitz's Alex Rider books led to a glut of teen boy action heroes. On the basis of some of the books I have read lately I think that a) 2010 is going to be a great year for YA/kids horror and b) we really need more science fiction books released for these age groups. 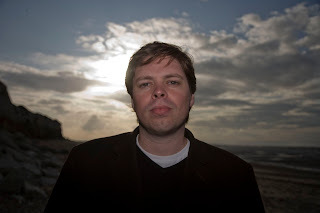 Joe Craig and Keith Mansfield have both written great science fiction stories over the past few years, and now Ben Horton wants a piece of the action. And if Monster Republic, the first in a new series, is anything to go by then I think Mr Horton will be here to stay. The publishers of Monster Republic have billed it as The Terminator meets X-Men and they are not far off with that comparison. Mix in a massive dollop of The Six Million Dollar Man (if you are of an age where you have no idea what I am talking about - ask your parents) and you have this: a fast paced sci-fi actioner with great characters and a storyline that is begging to be reproduced on the big screen. And the action is there almost from the start; there is no hanging around whilst scenes are set in this book. We have a slightly creepy Prologue, Chapter 1 to introduce us to Cameron, the main character, and his normal, everyday school friends (and one school fiend), and then BOOM!..... life for Cameron will never be the same again. The remaining 261 pages with their larger than average typeface do not leave much room for faffing around - once the action starts it hardly lets up until the final page. When reviewing the first book in a series I rarely expect full character development. After all, if a new character is introduced in a soap opera you don't expect to find out everything that makes them tick within that first episode. I would suggest, though, that Ben Horton manages to develop Cameron's character pretty well, aided and abetted by the plot - Cameron is thrown into situation after situation where he has to come to terms with what has happened to him; the reaction of other people to him; the lack of trust shown towards him by other victims of human medical experimentation gone wild; and so on, and so on. The personalities and motivations of many of the secondary characters are still something of a mystery to us as the action mainly focuses on Cameron, but I expect we will see these developed in future books. This really is movie blockbuster material and it is the sort of book that this blog was born to promote. The last five pages even present us with some glorious black and white graphic novel style images... perfect for boys who struggle with picturing images from the words they read, although I am not sure they will have much trouble conjuring up images of Cameron's manufactured appearance. Mr Horton does not give us lengthy passages of descriptive writing when it comes to Cameron and the other 'creations' of Dr Lazarus Fry.... again, he lets the action do the talking and if it weren't for these graphic novel images I would imagaine that every reader would formulate a different mental image of what Cameron looks like. Monster Republic is aimed at the 12+ market. It is published by Corgi and is in stores right now. My thanks go out to the kind people at RHCB who sent me this copy to review. Fact One: Sam Enthoven is a good writer. Fact Two: Sam Enthoven is a deeply weird and disturbed person. Fact Three: We love him for it. Who else could possibly conceive a nightmare so bloody awful and real that I still feel a bit twitchy between my shoulder blades when I think about Crawlers, Sam’s newest offering to his adoring fans. If you’re someone easily frightened then trust me when I hand you this warning: WALK AWAY, DO NOT READ THIS FOR FEAR OF NIGHTMARES. But if you’re a fan of critters that go bump in the night, things that creep and crawl, then read on! I find with Sam’s writing that it’s all very real, as you can tell from my shoutiness above. When I realised where the setting was going to be – The Barbican, one of London’s ugliest buildings – I had to laugh because I’ve attended a show there myself and I know what a strange and ugly place it is, so I could sympathise with the characters for being forced to go there to attend a theatre production. Crawlers is written from three perspectives: firstly, we meet the Queen who has been held captive by a very old London company for their own nefarious purposes. She’s a very intelligent creepy being who has been biding her time, waiting for someone to give her the chance to show off her skills for infiltration and deviousness. Then we meet Ben and Jasmine respectively. Ben attends Walsingham School for Boys, an exclusive private school but Ben’s not quite comfortable there. He’s into movies and superheroes and is a bit of a dreamer. Jasmine on the other hand is from Swatham Academy for Girls and it’s not quite as nice. Jasmine’s intelligent and good with maths and science – she works hard on her grades because she wants to make something of herself. This has her appear a bit aloof from others and she’s ridiculed for it. When chaos erupts at The Barbican, with the release of the crawlers (small insect crittery things that attach themselves to the back of the neck of their human hosts) Ben and Jasmine (who’ve merely seen one another in passing) manage to keep their calm and get their respective school mates to the relative safety of the security room. Mix a group of upper-class boys, a handful of girls who are out looking for trouble, in a small confined space, dash in some critters intent on taking over the human population who share a hive-mind, and watch what happens. It’s tense and intelligent. A good exploration of the various strengths and weaknesses characters display in a bad situation. Usual actioners have very little time for character development but in Crawlers Mr. E has managed to convey a good sense of who his characters are and what they’re about. You can see their progression throughout the novel and it’s gratifying to see how one of the weaker boys, stands up and fights not just for himself but for everyone else and how that affects him and those around him. Clever writing indeed. The novel takes place from 6pm to just before midnight on the same day. A lot happens. It’s breathtaking and scary and it freaked me out quite a bit. It’s also cinematic and you can tell that the author’s had a great time plumbing the depths of his own imagination on how to make tense situations even more tense and over the top. The ending is wow and the finale is ... waitaminute, did I just feel something crawl up my leg!? A huge thank you to Liz de Jager from My Favourite Books for this fantastic review. As I said recently, if you haven't discovered Liz's blog yet then you really should head on over there as she is also a big fan of YA and children's books, many of which are boy friendly. 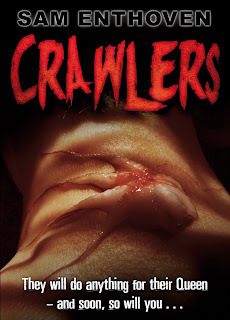 I read Crawlers myself last week and I feel that Liz's review really does it justice; it is a fantastic horror story with a wonderfully grotesque cover (the kids at school were totally grossed out by it). Crawlers is due to be published by Corgi on 1st April 2010. Sam Enthoven has kindly offered to take part in an interview for this blog so watch this space - maybe we will find out a little more about his twisted imagination. If you have any questions you would like me to ask him then please leave them as comments by 29th January. On his first trip to London to stay with his glamorous aunt and uncle for Christmas, Ivo Moncrieff steps off the train and stumbles into a nightmare. As he is waiting on the tube platform, a stranger thrusts a mysterious object into his hand, desperately muttering some unfamiliar words to him. On-board the tube moments later, the carriage next to Ivo's is overcome with panic and when they enter the next station the passengers disembark to find that the stranger's body has been brutally dismembered. Ivo guesses that the perpetrators must want the object, and if they find out he has it, he will be their next target. But the attack on the tube is part of a larger scheme to bring chaos to the heart of London. As the capital seems in danger of sliding into anarchy, Ivo faces a race against time to break the ancient power of the Liberators, a power that has lain dormant for centuries but now threatens to destroy society itself. I have made no secret of the fact that I am a big fan of fantasy stories set in London, so I was very excited when this book arrived from the nice people at Bloomsbury. However, I ended up being a little disappointed on reading this book. This was not through any fault on the author's part, only because London is merely the setting and, unlike other books (e.g. Stoneheart Trilogy, Neverwhere, A Madness of Angels) the city has not been imagined in any other way. I hasten to add that this was the only cause of disappointment for me as I otherwise really enjoyed reading this excellent story. In The Liberators, Mr Womack has written a fast-paced thriller, with a very contemporary feel, but with a supernatural undercurrent of ancient evil ready and waiting to be fully awakened to take over our society. He combines the modern-day concerns of the current financial crisis and the paranoia and fears surrounding terrorist attacks, with elements of ancient mythology and in doing so has created an original story that looks at what it means to be truly free and demonstrates how such freedom, however desirable it may initially seem, could rapidly deteriorate into total anarchy and ultimately the destruction of a civilized society. Ivo is a typical reluctant hero. He is an innocent boy, sucked into events that are initially way beyond his comprehension. How is it a whole train carriage of passengers can suddenly be overtaken by mass hysteria? How can a man in the next carriage be totally dismembered, yet no-one remembers seeing what happened? What is the plain looking object that this man so hastily passed to Ivo just minutes before his gruesome demise? Fortunately, Ivo has the help of two other young people to help him get to the bottom of this mystery, but even this help comes at a cost, as a result of the temptations laid before them in the story. Mr Womack does an admirable job of developing Ivo's character, and we are able to understand and associate with all the decisions he makes throughout the story. Although as secondary characters his new friends are not so well developed, their actions and reactions are also, on the whole, realistic. Mr Womack has also created a pair of particularly nasty villains, the Liberators of the book's title. One of the reasons they are so evil is that, much like when Edmund first meets the Ice Queen in The Lion, The Witch and The Wardrobe, they are offering something incredibly desirable - in this case freedom from all worldly cares and the moral constraints that bind us. In fact, in the early stages of the book I even found myself wondering why people known as Liberators were actually the villains of the book. However, as Ivo discovers more about their true nature and the dangers of hedonism, so does the reader begin to realise that however tempting such a concept is, it is also the very thing that can bring down a society. I found The Liberators to be a fast-paced, exciting read. Although Mr Womack's use of language is very accomplished and pleasurable to read, I would suggest that it is at a level that would be most appropriate for 10-13 year olds. However, confident younger readers will enjoy it, and although they may find the language a little below them at times older readers will also be able to engage with it on a slightly higher level due to its intelligent new look at the battle between good and evil. 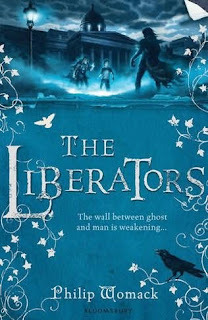 The Liberators is published by Bloomsbury and is due to be in stores on 1st February 2010. You had better fasten your seatbelts, for this book is one hell of a ride! In fact, after finishing it I almost felt like I needed a few hours to get my breath back. I say almost.... I was so wired by the non-stop action in the final scenes of the book that instead I popped the Wesley Snipes movie of the same name in my DVD player for another fix of extreme skydiving action. Ethan, the story's main character, comes from a troubled home where is mother has to endure a constant stream of verbal and physical abuse from his drunken father. Ethan himself, is not immune from this and is regularly informed that he is useless and his life will amount to nothing. Ethan is determined not to be like his father, but like many 17 year-olds he still has not found any direction in his life, and has no idea what he will do once he completes his A-Level studies in a year's time. One night he observes someone BASE jump (parachute) from the tower block where he lives, and so begins his adventure into the adrenalin-fuelled world of skydiving. Everyone knows that before becoming an author Andy McNab was in the SAS. What you may not know is that during this time he learned to skydive as a member of the Air Troop, and has so far made over 1500 freefall jumps, at locations all over the world. Many fledging authors are advised to "write what you know"and whilst there is no way that Mr McNab can be described as 'fledgling' due to the number of books he has written for both the adult and YA markets, his books are always more the better because he writes from experience. I'm no skydiving expert, but speaking as a layman his descriptions of the skydiving scenes seem very realistic, and I am willing to believe that they are because of his first-hand knowledge of this activity. This is the first book in a series, so in a similar vein to Robert Muchamore's The Recruit (first book in the CHERUB series), Mr McNab is using this story to set the scene for future books. This means, that despite the synopsis' promise of a Covert Operations team, it is only towards the end of the book that this part of the plot is fully revealed. The majority of the book focuses on Ethan's introduction to skydiving, his training and his bonding with the other members of the team. This is not to say that these earlier scenes are boring; in fact they are anything but. Andy McNab knows how to construct a thriller by varying the pace of his narrative; he knows where the quieter scenes are needed in order to help buld the tension to make the faster-paced scenes seem even more dynamic. The author also knows how to use quieter moments of the story to develop his characters. I felt Ethan was developed very well throughout the story, but the supporting characters not so. However, this is something we often see in the first book of a series which has to focus on the development of the main character; I expect we will learn a lot more about the others in future books. Despite not being fully developed, the characters in DropZone are certainly memorable, and the dialogue between them is sparkling and full of friendly banter. However, I guess in order to add more realism Mr McNab has spiced up this language with a few swear words in places. However, from experience I know that they are no worse than anything that can be heard on the average secondary school playground at breaktime. However, if you are not happy with your children reading dialogue like this then best you don't buy them this book. Similarly, some of the scenes towards the end of the book are fairly violent and not for younger readers, but this book will definitely appeal to boys (and many girls) aged 13+. 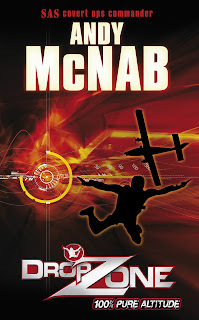 If future DropZone books are as well written then Mr McNab may well have created a series to rival Muchamore's CHERUB. DropZone is published as a hardcover edition in the UK by Doubleday on 4th February 2010. Thank you to the kind people at RHCB for sending me this copy to review. How did you get the idea for the Witchfinder Trilogy? Witchfinder came together from various sources. I’d always been fascinated by the English Civil War, and by that brief but terrifying period in the 1640s when people like Matthew Hopkins, the infamous Witchfinder General, went around the Eastern Counties hunting down and hanging suspected witches. For a long time I’d been intrigued by the 17th Century idea that, in order to work her spells, a witch would need the aid of a demon summoned from hell. I’d done a lot of research into this area over the years and hoped that, one day, I could mould a story around these ideas: witchfinders, witches, demons, magic and monsters. I wanted it to be a big, epic tale – lots of action and drama – but I had to wait for the right story to come along. Meanwhile, I’d been writing horror books for adults. It was while attending a book group discussion for one of my adult books that I met Deborah Chaffey, a Waterstones bookseller who specialised in children’s fiction. Deborah told me how much the kids in her reading group loved horror, and challenged me to write a really exciting, scary book for children. And so I went away and read lots and lots of Young Adult thrillers in order to get an idea of what was popular. Although I loved most of what I read, I realised that the idea of a 17th Century witch – one with demons at her command – had not yet been fully explored in this area. So that was the genesis for Witchfinder – a modern take on an ancient horror idea! Dawn of the Demontide is the first book in your Witchfinder Trilogy. Have you plotted out the storylines for the other two books already? Yes, Dawn of the Demontide is just the beginning! The second book, Gallows at Twilight will be out in January 2011 and the third, The Last Nightfall in September 2011. The wonderful thing was that, on the strength of Dawn of the Demontide, Oxford University Press immediately commissioned the other books in the series. I’m finishing Gallows at Twilight right now, and I’ve got the whole saga mapped out in my head. The ending of the last book is going to be HUGE – just really EPIC. But Dawn of the Demontide is a self-contained story, too: it has a definite beginning, middle and end. We travel with these characters through various nail-biting adventures until we come to this great big, earth-shattering finale. BUT here’s the thing: at the end of Dawn of the Demontide you might think that you’ve seen every twist and turn that these characters can take; that the stakes can’t get much bigger… But just wait for Book Two! Gallows is a twisted time travel story – time travel and demons! – There are a lot more surprises to come! One of the main influences is my love of history. Real historical events pop up in all my books, but especially in Witchfinder. Ever since school I’ve loved reading history books, especially that period after the reign of Elizabeth II and up to the end of the Civil War. The intrigue, the personalities, the battles, the bloodshed, the fear and the religious passion that literally tore families apart and set brother against brother is just fascinating. In fiction terms my biggest influences have been all those brilliant books I read when I was a kid. I think most writers will tell you that it’s those books they read in childhood that continue to have an impact on them later in life. For me it was Arthur Conan Doyle’s Sherlock Holmes stories; Stephen King; JRR Tolkien; CS Lewis; HG Wells; Richard Matheson; Shirley Jackson; MR James; Robert Louis Stevenson and dozens of others. I lapped up anything with a strong plot and with lots of action and adventure. A few scares were always good, too! You have already had two books published for the adult market. What made you want write for a younger audience? First of all it was the challenge laid down by my friend Deborah Chaffey: to write a truly scary Young Adult series. It was while researching children’s horror and thriller books that I realised what an exciting, vibrant and challenging form of writing this was. As soon as I latched onto the Witchfinder plot I couldn’t wait to get started. I knew that this had to be a children’s series because of the action and adventure, but I also wanted to give Witchfinder a taste of real terror, like in my adult books. Another motivation was to write something that my nephew Johnny could read as he was growing up – that’s why I dedicated the first book to him! How did you carry out the research when writing Dawn of the Demontide? Did you discover any really interesting facts during your research that you would like to share with us? The really in-depth research I carried out for Dawn of the Demontide was of a scientific nature… but I can’t really go into that for reasons that will become apparent when you read the book! A lot of the witches and demon stuff I already knew from my previous research into the area. The really heavy research didn’t kick in until book 2. Because a good third or more of Gallows at Twilight is set during the Civil War, I had to go back and brush up on the tiny details of that period – what people wore, what they ate, drank, what money they used, what kind of houses they lived in etc. There are several interesting facts about the witchfinder period, but I’m going to keep them to myself for time being as they will probably form the basis for the Witchfinder Tour, which will be visiting schools throughout 2010. The Tour is still in its early planning stages, but I’m hoping to come into schools and demonstrate to kids what it was like to be tried as a witch in the 17th Century! One interesting titbit of information I came across during my researches that I can share: the last person to be tried as a witch in England was a lady called Helen Duncan. She was tried and convicted at the Old Bailey in London in the year… 1944! Only sixty years ago! Anyone interested should look her up on Google – it’s a fascinating story! There are several pretty gory scenes in Dawn of the Demontide. How did you decide on the right level of violence for the story? Honestly, there’s not much difference between writing adult horror and horror for kids. You can be just as gory and gruesome writing for children, but there is an element of fun in kids’ horror which is often missing with the adult books. I had such a good time writing Witchfinder – coming up with loads of gross horror ideas and throwing them into the pot. I guess the main difference is that kids’ horror has a sense of humour! There are some really funny bits amid all the carnage. Watch out for what happens to Lollygag the cat! Some of the characters in Dawn of the Demontide share surnames with characters from Bram Stoker’s Dracula. Is this book a favourite of yours and are there any other similar references to classic horror in your book? The Dracula connection was deliberate – a homage to my favourite horror novel. There are other homages in the book, mainly to the old EC horror comics of the 1950s. Like Jake Harker – the hero of Witchfinder – when I was a boy my dad bought me a huge collection of horror comics for my birthday. The stories from comics like Tales from the Crypt have influenced lots of horror writers, especially Stephen King. They were gory, grisly and gruesome – exactly the kind of qualities I wanted for Witchfinder! Another homage in Witchfinder is to Charles Dickens – my favourite author of all time. He wrote some pretty creepy things himself – check out his brilliant ghost story The Signalman. A lot of the characters in my book have Dickensian names, like Mr Quilp (from The Old Curiosity Shop) and Mr Pinch (from Martin Chuzzlewit). Finally, I’ve always been a big fan of MR James: to my mind the greatest writer of ghost stories that ever lived. James was a master at describing ominous landscapes, and that’s something I’ve always tried to do in my own writing. I guess the obvious names like Darren Shan and Anthony Horowitz will already be familiar to many. I would also recommend rising talents like Michelle Harrison (The Thirteen Treasures), Sam Enthoven (Crawlers) and Barry Hutchison (Invisible Fiends). These guys are huge talents and their books never fail to draw you in. An old one – The Adventures of Sherlock Holmes. Brilliant writing, superb plots, scares, thrills and spills galore. These stories might be over a hundred years old, but they are as fresh today as when they were written. Can you give us any hints as to what we can expect from your next book in the series, Gallows At Twilight? Gallows will include: Demons and time travel. The Seer of the Pit. The Scarab Path. Ecto-suits. Warriors from the Wall. The truth about Simon Lydgate… And Matthew Hopkins, the real Witchfinder General, might just make an appearance. That’s all I’m saying! Keep reading! Especially if, one day, you want to be a writer. The most important thing any writer can do is read and read and read! Thank you William for such great answers to my questions. I really hope that the Witchfinder Trilogy is a huge success - January 2011 is such a long time to have to wait for the sequel but if it is anything near as good as Dawn of the Demontide then it will be worth the wait. If you have not yet popped over to the Witchfinder website then it is well worth a visit, and some great new content has been added over the last couple of weeks, including the chance to win a pocket sized video camera. Often mistaken for a boy because of her haircut and name, Alex Morningside is an inquisitive girl of ten-and-a-half who attends the prestigious Wigpowder-Steele Academy. Unfortunately, though she loves to learn, Alex just can’t bring herself to enjoy her classes. Her teachers are all old and smelly and don’t seem to know about anything that has happened in the world the past thirty years, and her peers…well they are quite simply ridiculous. Luckily for Alex, the new school year brings an exciting new teacher. Mr. Underwood makes lessons fun and teaches her how to fence. But Mr. Underwood has a mysterious family secret - the swashbuckling and buried treasure kind - and not everyone is glad he has come to Wigpowder-Steele. 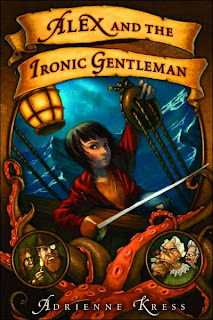 When the infamous pirates of a ship called the Ironic Gentleman kidnap Mr. Underwood, Alex sets off on a journey to rescue him, along the way encountering a cast of strange and magical characters, including the dashing and sometimes heroic Captain Magnanimous, Coriander the Conjurer, the Extremely Ginormous Octopus, and the wicked Daughters of the Founding Fathers’ Preservation Society. Adrienne Kress has one of the most unique writing voices I have come across in years, but now I come to write about this book I am finding it very difficult to describe it in a way that will do it justice. It is a little bit Roald Dahl, a little bit Lewis Carroll and a little bit Lemony Snickett but by saying that I almost feel I'm not being fair to Ms Kress as her work is certainly not a copy of these authors' styles. In addition to being a writer, Ms Kress is an actress and also does some teaching of drama to 8-12 year olds, and I suspect this contact with children has had a great influence on said writing voice. Her writing shows that she knows how children think,how they speak and most of all, how surreal their ideas can sometimes be, for Alex and the Ironic Gentleman is incredibly surreal in places. This author certainly knows her audience and that is one of the reasons I am very comfortable in comparing her work with Roald Dahl. This is a great book for children of age 8 and above, whether read by themselves or as a bedtime story read out loud by someone else (believe me... this book was made to be read aloud by a confident reader - I need to get my hands on a copy of the audio book!). It is chock-full of humour and adventure that should appeal to both boys and girls, and boys should not be put off by Alex being a female main character - girly, she is not! There are also some delightfully creepy villains along the way (the nasty old ladies of the Daughters of the Founding Fathers' Preservation Society are truly priceless), and best of all, because of the way Ms Kress writes I found it very easy to picture these various characters in my head. Like I said, this book is pretty surreal, and Alex's adventures are far from ordinary (have you ever come across an Extremely Ginormous Octopus drowning his sorrows in a bar bemoaning the fact that film directors prefer using CGI?). Alex's tale also involves many other literary elements including light horror and fantasy, and I love the way Ms Kress has skilfully combined these elements together. Ms Kress is from Canada, but spent three years of her life studying in England, and this is very apparent in her writing as there are elements from both sides of the Atlantic in her story. In fact, at times it is difficult to determine whether her tale is set in a fantasy place akin to Britain, or whether is it more like the USA/Canada. Similarly the placing of the time period is difficult. At the beginning you feel it is a fairly modern setting, but then something else happens and you change your mind and decide that it must be set in the past, but then all of a sudden there is mention of a laptop (owned by the chronicler of the pirates' adventures). This is not a case of poor writing or editing, it is just something else that adds to the delightful quirkiness of the story. And then we come to the plot. Please don't go expecting a linear plot whereby Alex sets out on a mission to rescue her teacher and by the end of the book is successful in that quest. This is more a series of mini-adventures, some of which distract the reader from the main plot completely, all rolled into one big story arc. It is here that the various secondary characters really play a huge part in making this such an enjoyable read, for instead of impatiently flicking through these scenes quickly in order to get back onto the primary plot, I instead found myself reveling in the sheer variety of the hilarious personalities of the multitude of lovingly created supporting characters that Alex meets along the way. Alex and the Ironic Gentleman is published by Weinstein Books and is available to buy in the UK. It has been around for a couple of years and is a real gem of a book. If you have younger boys or girls it is well worth buying. Somehow I now need to get my hands on a copy of Timothy and the Dragon's Gate, Ms Kress' second book (in which, I gather, Alex and some of the other characters also make an appearance). 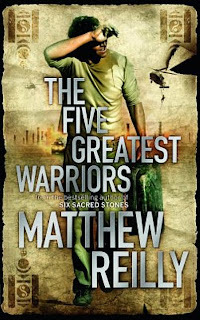 I am immensely pleased to inform you that my guest review of Matthew Reilly's The Five Greatest Warriors has just gone live at Liz and Mark de Jager's brilliant My Favourite Books blog. My Favourite Books has been around for a few years now so I was very flattered when Liz asked if I would review this book for her. Liz is a fellow YA fan and you will find many books for this age group reviewed on their blog, along with many other books aimed at the adult market. I have been a fan of Matthew Reilly's work since I first read Ice Station nearly ten years ago. His work is perfect for boys who love action and adventure stories, but feel that they may have outgrown the likes of Anthony Horowitz and Robert Muchamore. The level of violence in Matt Reilly's books dictates that they are not particularly suitable for younger boys, but the older ones will love them. 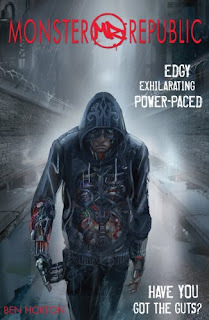 Please take the time to pop over the My Favourite Books and read my review and some of my wider thoughts about Matthew Reilly's work. The Five Greatest Warriors is published by Orion and is due to be in stores on 21st January. Finally, a huge thank you to Liz and Mark for giving me the opportunity to spread my wings a little. If you have not yet discovered their blog then believe me, it is well worth following. Forced into a life on the run, Cal finds himself hunted by ruthless criminals and the police. Somehow he must uncover the truth about his father’s mysterious death and solve the Ormond Singularity, a secret from the past, before the year is up. But who can he turn to when the whole world seems to want him dead? Interesting concept. Gabrielle Lord, and her publishers Hodder, have produced the book equivalent of television's 24. 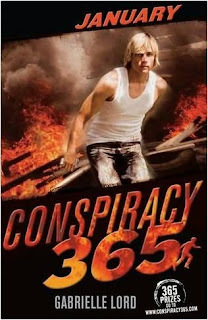 However, instead of the story being set over a period of 24 hours, with each episode focusing on an hour in the story, Conspiracy 365 will be told over a period of one year with each book representing one month. Thus, January is in the shops now, February will be out in..... you guessed it, and so on. Like I said... interesting concept. But is the story any good? Well Ms Lord certainly knows how to grab your attention and pull you into a story. I gather that she is "one of Australia's bestselling crime writers for adults" and on the face of this book she has now transferred her talents to a younger market. January is a fact paced, action story, with a reluctant hero who suddenly finds himself on the run from criminals who want information from him that he is sure he doesn't have, and from the police who suspect him of attempted murder. Despite this being the first of twelve books (and a slim 185 pages at that), the author still manages to do a pretty good job of developing Callum, her main character. The secondary characters are far less well developed, but I expect we will see more of them in later books. As for the plot? So far so good - January certainly sets the scene for the story that will unfold over the coming year and most of the book is pretty frantic in its pace. I say 'most' and this is where I feel that the concept brings with it a weakness. Instead of having evenly lengthed chapters, the narrative is broken up using times. Sometimes there is only a difference of minutes between the start of one 'chapter' and the start of the next. However, later in the book suddenly we have a spce of four days, where it seems that Callum just sits around doing not a lot at all. Normally this would proably not be as noticeable, but coming as it does with a time label, and after earlier scenes that were packed tightly into shorter time spans, this sudden jump in time sticks out like a sore thumb. Another weakness is that despite each book ending on a life-threatening cliffhanger, the fact that there are twelve books in total would suggest that Callum will manage to survive every one of them, surely reducing the tension just a little. Still, like I said, you're never more than thirty days away from finding out what happens next. Boys will love this concept. It is a series of books where they do not have to wait a year or more for the next part of the story to be released. And this is where I have my big moan. These books cost £5.99 each. Over a year, that makes nearly £72! To me, that is a lot of money to be spending over that period. I'm not sure I will be buying any more of them - it will mean visits to my local library in order for me to follow the rest of the story. Even at half the asking price I still feel it would be quite a lot to be asking in total when there are so many other excellent books on the market and therefore, despite my 'interesting concept' statement I am just not able to feel excited by it. If you have the money though, then this series will be a great way to get a reluctant boy reader interested in reading. If you haven't yet discovered Matthew Imrie's Teen Librarian website then you really should head on over there at some point. It is a website for "Librarians and those that work in a library environment whose primary (and sometimes secondary) role it is to work with Teenagers", but I feel it also has great appeal to parents and to teenage readers themselves. 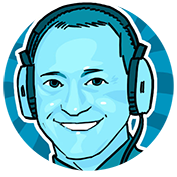 On Matt's site you will find book reviews, author interviews, and a host of ideas that can be used to encourage young people to read more. Matt also produces the Teen Librairan Monthly newsletter and I was very flattered when, back in December, he asked if I would write an article about myself and my blog. That article can be downloaded as a pdf here. Thank you for asking me Matt - it was fun to write and I hope your readers enjoy it. Will Hodge's life is a mess! His mother is dead, he has no friends and he thinks he is being followed by a strange group of people who tell him they know him. But Will can't remember them ...at first. And when he does he doesn't like what he can remember. While Will is struggling with unsettling memories, he learns that his past is a lot deeper than many people's, and he has to find out if he is strong enough to break links with the powerful hold that history has on him. Despite this being Gemma Malley's third book (the other two being The Declaration and The Revelation) this is the first book by her that I have read. It is a standalone novel, however based on the quality of The Returners this is an error on my part that needs rectifying as soon as possible. Will Hodges, the main character of The Returners lives in a Britain of the not-too-distant future, and the story paints a pretty bleak portrait of British society at this time. The economy is crumbling and a nationalistic political party is rapidly gaining public favour with slogans such as England for the English, and British jobs for British workers. The fact that our current society is not a million miles away from this one with the BNP making headway in some areas and hate crimes taking place on the streets makes it an even more thought-provoking and, at times, disturbing read. It took me a few chapters to get into this book but once I did I read it in one sitting. The reason I found it so hard at the beginning is that Gemma Malley has created a protagonist that it is very hard to like initially. Will's mother died when he was eight, apparently commiting suicide whilst he watched on, and now he is full of self-loathing. His home is not a particularly pleasant place to return to after a day at school as his heavy drinking father's attitude is becoming increasingly bigoted, due in no small part to his friendship with Patrick, a senior member of said nationalist party. On top of all this, as a reader you rapidly begin to suspect that Will might also be bipolar, demonstrated by his mood swings and moments of memory loss. So, all in all, a pretty difficult character to associate with but believe me this book was well worth my perseverence. The first part of the story deals with building the characters of Will, his father and his friend Claire, whilst also giving us some back-story relating to his mother and the months running up to her death. During this part of the story we also see Will having vivid and disturbing dreams, and his increasing paranoia caused by the odd looking people who appear to be following him. It is only as Will finally starts to talk to these "freaks", the Returners of the book's title, that this book began to really pull me in. At this point Gemma Malley introduces a supernatural element to her plot, and the story suddenly becomes more than just a tale about a depressed teenage boy struggling to understand his life, and becomes a chilling exploration into the differences between fate and free will. I refuse to go into more detail regarding this as I would hate to spoil the surprises this book will deliver. All I will say is that by the end of this book I am positive that you will have experienced a full range of emotions (not all of them pleasant by the way) and like me you will be racing out to buy Ms Malley's other books. 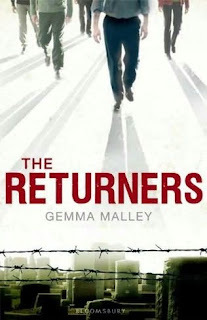 The Returners is scheduled to be published on 22nd February 2010 in both hardback and paperback, and I feel very lucky and grateful to have been sent a copy by Bloomsbury to review on my blog. I think all of my UK readers need a bit of cheering up after the horrendous weather we have been experiencing over the past week. I can't think of a better way than this, so as promised in my recent review of Zero Moment, the third instalment in the Joshua Files series, here is the interview that I did with M.G. Harris. If this interview whets your appetite for more then you really should visit the official Joshua Files website, MG's own blog or the Official MG Harris Fan Site. Zero Moment is the third book in the Joshua Files series, and you have said that there will be five books in total. Have you plotted out the storylines for these already? I've written Joshua #4 already. I haven't plotted the final installment yet. The plot and indeed book itself will be better if I leave as much time as possible and maybe write something different in between. Time travel is an integral part of Josh’s story, and you develop this even more in Zero Moment. How on earth do you manage to keep track of this element of the story? Capoeira is used increasingly as Josh’s story is progressing. How did you carry out the research into this martial art? I've watched capoeira performed quite a bit in real life, here and in Brazil. Then there's YouTube, the movie 'Only the Strong' and all those capoeira websites. There are some new locations in Zero Moment, namely Brazil and Switzerland. Did you visit these places as part of your research? Yes, some great friends of ours are Brazilian so we went for a joint holiday/research trip! The exciting day of dune buggies, river barbeque and zipwire fun that Montoyo promises Josh is one we actually enjoyed. Poor Josh, he never gets to have any proper fun! My brother and his family live in Switzerland so I'm there quite often. The Sustenpass alpine location in Zero Moment was a surprise discovery one summer. We ended up on the high mountain pass by mistake...mid August but up there, it was snowing! Zero Moment also delves deeper into aspects of genetics and science. How has your background in biochemistry helped you develop your story? Totally. If you have that kind of knowledge ready to hand, certain plot solutions easily come to mind. Zero Moment deals a lot with Josh’s emotions and his confusion about his relationship with Ixchel. As a female author, have you found it difficult to write your books from a boy’s point of view? It's the most difficult part. I have to think about things for hours and remember the boys I knew when I was younger, listen to songs written by young guys, to help me judge if I'm on the right track. My natural sympathies often lie with his mother or Ixchel, so it's a matter of shifting the perspective, seeing things from Josh's point of view. I tend to ask my husband a lot of questions about how teenage boys feel about things. He's the touchstone there. Usually he confirms all my suspicions! I asked him if teenage boys spend much time dreaming about girls and he just laughed and said "That's ALL I thought about!" Like me, you were a big fan of the Tintin stories when you were younger? What was it about them that appealed to you? Are you looking forward to Spielberg’s film adaptation? The exotic locations, the very traditional adventure plots. Tintin himself is a really appealing character for girls too. He isn't macho or aggressive, he's honourable and cares deeply for his friends. There are some terrific other characters too. Like Bianca Castifiore! Those books always made me laugh. In fact, finding one in the library was always like finding treasure. Spielberg is the king of old-fashioned, romantic action-adventure, in my eyes. But I worry a bit about whether those stories have what it takes to transfer to the big screen. The stakes - personal above all - must be very high for a movie. Tintin often goes off exploring on little more than a lark, curiosity or a whim. That won't work. Spielberg understands this better than most, so hopefully he'll make the changes we need. In addition to Tintin, what were your favourite books when you were younger? Other comics like Asterix and Roy of the Rovers, also E. Nesbit, Ray Bradbury, Robert Heinlein's juveniles, most of all the William stories of Richmal Crompton. "Ender's Game" by Orson Scott Card. It's about a boy who's picked to go to a special Battle School where kids are trained to fight an alien force that is on its way to eliminate humanity. It's not written as a book for children but all the main characters are children or teenagers. It was published when I was 18, and I really enjoyed it but I would have loved it madly and deeply if I'd read it aged 13. On your blog you have mentioned the recent disaster movie “2012” a number of times. What did you think of it? It was daft but fun. Who knew watching the world fall apart could be enjoyable? I think the 2012 factor was pretty incidental to the plot though. "Avatar" is much, much better! Can you give us any hints as to what we can expect from your next book in the Joshua Files series? "Dark Parallel" is the big time-travel episode. I had to have at least one! So I tackle the bigger questions of causality...if someone changed history, what could happen on a personal scale? To the world around you? Then there's the question of Josh and his unrequited feelings. Is he ever going to 'man up' and confront Ixchel? Purely for nostalgia purposes, I think it would be Mexico City in the 1970s. I once found an old travel guide from the seventies in a hotel room in Mexico and it said, "Muggings are very unusual in Mexico". Can you imagine? Even in the eighties that was laughable. I was (very politely) mugged in Mexico City, in 1986. Now they sometimes kidnap you and worse. It's terribly sad. I still love Mexico City, it's the most exciting place I know. But you need your wits about you. And of course I'd be able to meet my parents when they were in their 20s! They both died aged 46 so I haven't seen them for a while. You can still find that old Mexico if you get away from the big cities and from the tourist zones. Maybe that's why I take Josh to those parts of Mexico. In a way I am time-travelling - in my mind. Back to your blog again..... you have hinted at a Quite Secret New Thing you are developing. Care to share any more hints with us yet? Late childhood (10-14) is an amazing time for your brain, before it's finished developing and before the serious hormonal stuff starts. That's the time to hit your imagination...what sticks then will stay for life. So, read at least one amazing book or series and get your parents to take you to Disneyland before it's too late for you to enjoy it as a child. Thank you for your wonderful answers MG. I can't believe it is a whole year until Dark Parallel is published.... I am already looking forward to it! And your QSNT sounds very exciting too. When Ty witnesses a stabbing, his own life is in danger from the criminals he s named, and he and his mum have to go into police protection. Ty has a new name, a new look and a cool new image life as Joe is good, especially when he gets talent spotted as a potential athletics star, special training from an attractive local celebrity and a lot of female attention. But his mum can t cope with her new life, and the gangsters will stop at nothing to flush them from hiding. Joe s cracking under extreme pressure, and then he meets a girl with dark secrets of her own. This wonderfully gripping and intelligent novel depicts Ty/Joe's confused sense of identity in a moving and funny story that teenage boys and girls will identify with. Readers of my blog will know by now that I thrive on action and adventure stories; tales that help me escape the pressures of my job. For this reason, and the fact that I hear enough about this sort of thing as part of my day-to-day work life, I would rarely ever buy a book that deals directly with the issues that face the modern teenager on a daily basis. I have taught Citizenship; I have discussed these issues with countless young people; I really don't feel the need to be reading about these issues in my spare time. However, thanks to the kind people at Frances Lincoln, this book arrived on my doorstep and due to school being closed as a result of the snow I decided to promote it to the top of my reading pile. Truth be told..... I am really glad that I did as When I Was Joe is a compelling, fast-paced modern thriller that had me gripped almost from the start. I say almost from the start and this is probably the only negative thing I have to say about this book, so I will get it out of the way now. Ty, the main character of the story, has witnessed the murder of a fellow fourteen year old, as a result of which he is fast-tracked onto a police witness protection programme. Ty's interview by the police and his and his mother's relocation all occur in the first two relatively short chapters of the book; personally, I felt that this all seemed a little too rushed and therefore less believable and I would have preferred another chapter to help ease me into the story. Then again, my only knowledge of witness protection in the UK stems from my wife's love of The Bill on TV so maybe things do move this fast in real life? That aside, the rest of the book is very realistic and despite it being written in the first-person, present tense (normally one of my pet hates) I loved it. In fact, I have to admit that the author's use of tense and point of view works really well with the story, for the main focus of the story isn't witness protection; it is really about how Ty copes with this sudden and dramatic upheaval in his life. Identity and image are all-important for young people, so how would you react if you suddenly had to re-invent yourself and become someone totally different? Would you be able to keep your past a secret to protect you and your loved ones? Once you have told one lie about yourself, and then another and another, where do the lies stop? Scary thoughts aren't they, but all issues that Ty has to deal with in this book once he becomes Joe. Incredibly, Ms David has really managed to get inside the head of a teenage boy and portrays Ty's feelings brilliantly. Boys of this age really do think that way and her characterisation of Ty and the other young people in the story is spot on. The dialogue is also very realistic - some readers may not like the way that Tye slips into using "youth speak" (horrible phrase, but I'm not sure what else to call it), and the use of swear words, depending on who he is talking to. Wise up people - this is what teenagers do when they are with their peers. It gives them a sense of belonging within a group; it distinguishes them from their seemingly boring elders; it makes them feel relevant in their society, and the author's use of this technique is used well in the story amd makes the dialogue more realistic. Above everything else, this story is relevant. I have lost count of the times I have had discussions with students at school where they have told me that some of their main worries in life include bullying and knife crime. In addition this book also addresses the topic of self-harming in a sensitive manner; this is an issue that is very relevant in today's teenage society as more and more young people feel the need to harm themselves for a multitude of reasons, that are often incomprehensible to their peers. However, the adressing of these issues in the story, as well as some of the swearing in the dialogue, would lead me suggest that this book is most suited to readers of the 13+ age range. 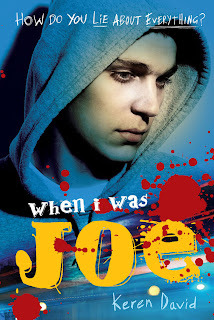 When I Am Joe is available to buy now and if, like me, you enjoy reading this book you will be overjoyed to hear that there is a planned sequel entitled Almost True due to be published in August 2010. Inspired by the work of the nineteenth-century French illustrator Gerard, who worked under the pseudonym 'Grandville' and frequently drew anthropomorphic animal characters, it tells the story of Detective Inspector LeBrock of Scotland Yard as he stalks a gang of murderers through the heart of Belle Epoque Paris. In this alternative reality France is the major world power and its capital is thronged with steam-driven hansom cabs, automatons and flying machines. The characters are mostly animals, though there is an underclass of humans, often referred to as 'dough faces', who resemble the 'clear-line' characters of Herge's "Tintin" books. Visually stunning, "Grandville" is a fantastical and audacious rollercoaster ride that will add to Talbot's reputation as one of the best graphic novelists in the world. I simply do not read enough Graphic Novels, yet the few I have picked up recently suggest that there is a wealth of beautifully illustrated such items out there, all with great boy-friendly storylines. 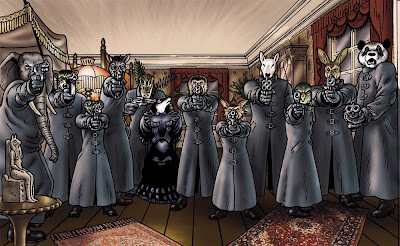 Last month I reviewed the brilliant Calamity Jack; in that review I stated that that I would be aiming to read more books in this genre in 2010 and Grandville is the first...... and I loved it! It is a fast and furious steampunk adventure, with more action scenes than a Daniel Craig Bond film. In fact, imagine James Bond being played by a huge, muscle-bound talking badger; cross him with Sherlock Holmes and place him in an alternative-history Britain which has spent two hundred years under the tyrannical rule of the French; add into this cauldron the topical subject of terrorism and an attack on a tower in the French capital with shades of 9/11 and the final result is Grandville. A very long-winded description, I know, but it's the best you're going to get - my mind is still reeling from this reading experience! This image (borrowed from Bryan Talbot's official website) will give you a taster of the detail Mr Talbot puts into his illustrations, as well as the sumptuous quality of the rendering of his artwork. As a result of this incredible level of detail the book can be read on two different levels. Some readers will enjoy it simply for the fast-paced plot, the OTT action scenes and the aforementioned artwork. Other, probably older and more knowledgable readers, will start to spot the many clever references to classics of the genre, film noir and other elements of popular culture that Mr Talbot slips seamlessly into his work. And there are so many of these that like me you will probably want to read it several times in order to spot as many of them as possible. There are nods to such icons as Tintin and Rupert the Bear, as well as the works of HG Wells and Beatrix Potter, to name but a few. 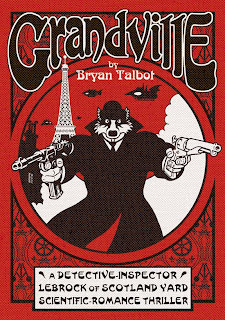 Grandville really is a rip-roaring detective/spy adventure story that will have you scanning the pages as fast as possible, pulled along by the frantic pace of the story. However, as I have already mentioned, it won't matter if you miss anything by reading so fast as I guarantee that you will want to re-read it for a second, third and probably fourth time at a much slower rate, even if just to feast your eyes for longer on Mr Talbot's amazing artwork and the huge array of characters he has created. Characters such as Detective Roderick Ratzi; Andre Pegasus, the equine Drug Baron of Paris; Snowy Milou, drug addict; and Honourable Citizen Turtell, the British Ambassador to France (and no prizes for guessing what sort of animal he is). A word of warning though - this book is definitely not for younger readers. There are many moments of sudden, and often gratuitous violence littered throughout and the language used by some of the characters is also occasionally a little profane. However, boys who have grown up loving Graphic Novels and wanting more, but of aimed at a more mature audience, will absolutely love this book. Whatsmore, it is published by Jonathan Cape in a lovely retro hardback style, and is well worth the asking price. There is also a sequel rumoured to be released later this year, entitled Grandville Mon Amour and I for one am avidly awaiting the next adventure of Detective Inspector LeBrock. Oxford University Press, the publisher of Witchfinder, is heralding William Hussey as "the New Master of Dark Fiction", and based on this story I would suggest that the people at OUP really know their stuff and are on to a sure-fire winner with this author. Dawn of the Demontide is the first book in a planned trilogy, but it is not just a vehicle for setting the scene for the next two books. In fact, so much happens in this book that I am finding it difficult to write a detailed review without any spoilers. This book has everything a young horror fan could thirst for: a horror-loving hero who is considered unpopular and a loner by his peers; a truly evil villain who thinks nothing of inflicting horrifying punishments on anyone who crosses him, members of his own coven included; ancient rites involving blood sacrifice; deadly mist that could only emanate from the depths of hell; witches and their terrifying familiars; the list goes on and on. This is William Hussey's first venture into the world of YA fiction but he has honed his craft with two spine-chilling books written for the adult market (under the name Bill Hussey). However, in this transition to writing for a younger audience Mr Hussey has most definitely not felt the need to hold back from writing a very dark and terrifying story. In fact, there are a number of particularly gory moments in this book which lead me to suggest that this is definitely for the 12+ market, especially with Mr Hussey's talent for writing vivid horror scenes that are rich with blood-curdling detail. His other talent is for providing an intricately plotted narrative that twists and turns throughout, keeping the tension levels high and never quite giving the reader enough information to be able to guess just what is going to happen next. The author certainly knows his subject as well. His passion for "horror stories, folklore and legends" (as stated in the short author biography at the end of the book) shines through in his writing, and also with his nods towards classics of the genre. For example, Jake Harker and Dr Holmwood are very obviously named in tribute to Jonathan Harker and Arthur Holmwood, the co-hunters of Dracula in Bram Stoker's legendary masterpiece, and with its similar tone of dark, brooding menace Dawn of the Demontide is the kind of book that you will struggle to put down. I therefore suggest you start reading it on a bright, sunny morning as you certainly won't be wanting to read it after the sun goes down and the creatures that prowl the dark night are itching to tap on your bedroom window. If you are a fan of YA horror then you will find this book a hugely enjoyable read; it is due to be published in March, with the second book in the series, Gallows at Twilight, and the third, The Last Nightfall, due for publication in January 2011 and September 2011 respectively. 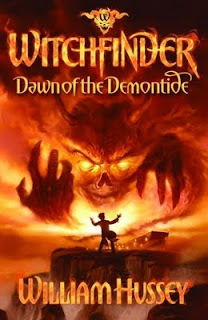 You can read the first chapter of Dawn of the Demontide at the official Witchfinder website. (Thank you to the book's editor, Jasmine Richards at OUP, for sending me a copy of this book to review). Josh thinks that he has discovered the key to time travel. Should he use it to save his father? Ixchel knows what he intends to do. Should she stop him? Before they can decide, Ixchel is kidnapped by the people who want to see an ancient prophecy predicting the end of the world in 2012 come true. It's up to Josh to save Ixchel and possibly save the world. Time is running out . . . This may sound a little melodramatic, but I struggle to express in writing how happy I was to receive a copy of this book a few weeks ago as I am a huge Joshua Files fan. As I have mentioned previously in my blog, I was first attracted to Invisible City, shortly after its publication, by its brilliant neon-orange plastic slip case. Some books are not as good as their covers, but Invisible City is not one of these - it hooks you from the very beginning with its combination of traditional prose and Josh's revealing blog posts. The second book in the series, Ice Shock, was even better and now we have the third instalment in The Joshua Files.... Zero Moment. So is it any good and does it live up to the quality of the preceding two books I hear you ask? And the answer is a very definite YES! Yet again, MG Harris pulled me into the story at the very first chapter, kept a firm hold on me through every one of the 356 pages, and then didn't quite let go at the end by teasingly providing me with a brief excerpt at the back of the book for the next in the series enititled Dark Parallel. Several weeks on and I am still finding my thoughts being occasionally drawn back to the story and wondering where it will go next, just as I did after reading each of the Harry Potter books for the first time. And the parallels with Harry Potter don't stop there. I liken Zero Moment in no small way to Harry Potter and the Order of The Phoenix. In Order, JK Rowling was criticised by some for the time she spent dealing with Harry's teenage angst; the confusion he was experiencing regarding his feelings for his friends (and girls in particular) and the concerns he had regarding his future and the fact that he questions why he is being kept in the dark by Dumbledore and others. I have always felt this criticism to be unfair.... Harry was a boy in his mid-teens and boys do go through these phases and MG Harris has had to do something similar with her main character, Josh Garcia. In Zero Moment Josh is confused about his relationship with Ixchel - is she a friend or do his feelings for her run deeper than that? Are there things that Montoyo and Vigores aren't telling him? What should he do with the knowledge about his father and time travel that he discovered during the Ice Shock story? And just who is the mysterious Arcadio? I hope that readers and reviewers alike will understand the necessity for some of the slower passages in this book, and also the fact that not all of these questions will be answered in this instalment. With Zero Moment MG Harris is certainly setting the scene for a brilliant final two books in the series. Zero Moment, then, is definitely slower in places than its predecessors, although as I have already said this is not a bad thing, and it certainly keeps the tension building. However, in order to reward us for our patience in these deeper moments, MG treats us to a number of white-knuckle ride chase scenes that certainly make the wait worthwhile. The dune buggy chase near the beginning of the book and another chase involving several modes of transport towards the end are brilliantly written and will have you torn between wanting to read every word or wanting to speed read through the pages as quickly as possible to see whether our heroes manage to escape this next great test of their abilities and endurance, or is it time for one of them to be killed off? Zero Moment really is as captivating a read as the first two books in the series, and takes The Joshua Files story to its next level. The detail that MG Harris puts into her writing continues to make the reader empathise with Josh's confused emotions completely (as opposed to Order of the Phoenix where occasionally I really did want to give Harry a slap and tell him to pull himself together). She also very cleverly keeps us guessing at every moment with her plot twists - there really is no second guessing where the story is going to go next, yet at all times she manages to maintain the believability of her characters and their actions. 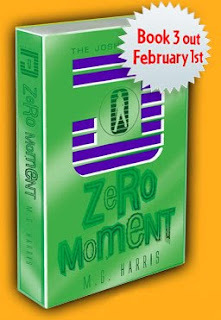 Zero Moment is scheduled for release on 1st February 2010 but I wouldn't be surprised if it starts to creep onto store shelves a little earlier than this. Watch out for the limited edition signed copies in neon-green plastic slip cases that will also be found in a number of select stores around the country (but don't ask me which ones - I'm not important enough to know lol). Next week I will also be publishing on my blog an interview with MG Harris that we did by email shortly before Christmas - she has provided some very interesting answers to my questions so please watch this space! Happy New Year to you all.... I hope you have a fantastic 2010!